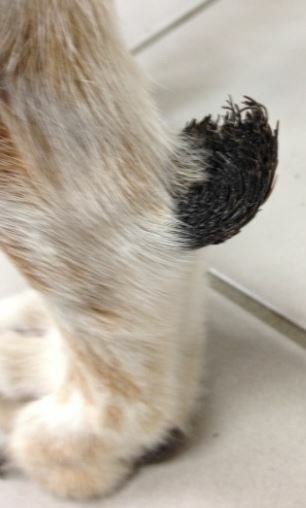 Recently, I found two large black colored growths on the front legs of a dog. These growths were located right behind the carpus or wrist. They were firm to the touch and did not seem to bother the dog at all. Once and awhile, the dog would chew on the growths but they never bled. Study the image below then answer the following question: What is the name of this condition? What is the name of the pad in this area? How is it treated? Hyperkeratosis is a benign condition that occurs on the nose and pads of dogs. Keratin is a firm material that provides structure for hair, skin and nails. Hyperkeratosis, which means too much keratin, can be caused by many things. In practice, I see it most often in older dogs. Treatment of hyperkeratosis is similar to treating a callous in humans. The extra material is removed down to healthy skin. In this patient, the keratin was cut away with a tough scissors. For the nose, I generally soak the keratin with a moist paper towel to soften it, then scrape it off. There are medications designed to dissolve the keratin but I generally don’t recommend them because they sometimes irritate the skin.